The Celtic people were not without their own form of currency; very few societies on history could effectively manage a system of trade and bartering without some form of currency that accompanied it. 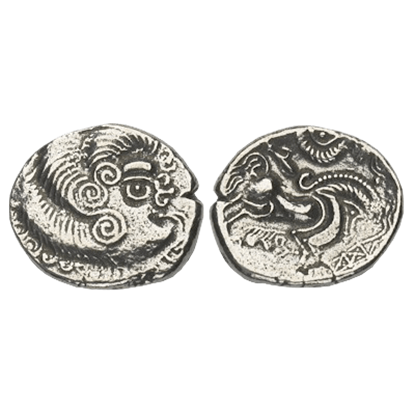 We carry a select assortment of Celtic coins that were inspired by historical coins that have been identified as Celtic in origin. All of our Celtic coins are made from pewter, and feature either an antique-plated finish or a gold-plated finish. Most of our Celtic coins are staters, which translates in ancient Greek to weight. Many of our Celtic coins were also produced by the Celtic settlers of Briton and Armorica. 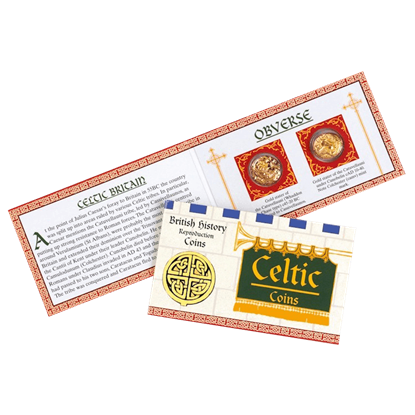 These Celtic coins make for great collectors items, and double as wonderful gifts to children of all ages and to gamers; they also make for wonderful false currency and accessories when used at re-enactments and fairs. This is a reproduction Armorican Stater coin, which depicts a Celtic head on the obverse and horse galloping over a boar on the reverse. These Armorican Stater Replica Coins come 10 in a pack so you can fill your coin purse. The Cunobelin Stater was an ancient pre-Roman coin named for the king, Cunobeline, who ruled from the late first century BC until the 40s AD. The Celtic Coin Pack Cunobelin Stater allows you to learn more about this coin. The Trinovantes Stater was an ancient Celtic coin named for one of the Celtic tribes of Britain, near the regions of modern day Essex and Suffolk. 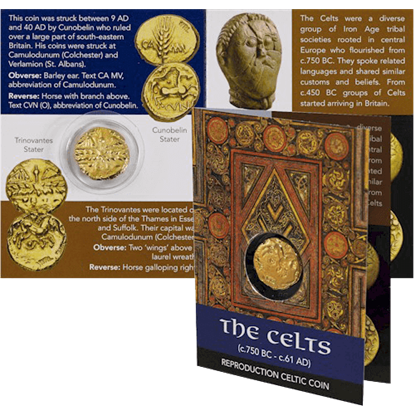 The Celtic Coin Pack Trinovantes Stater allows you to learn about this coin. 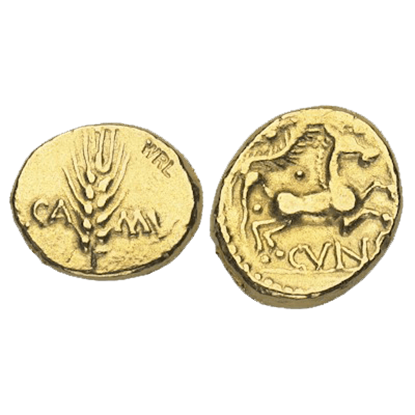 Our reproduction Gold Stater of the Catuvellauni would date from 45-20 BC and is made from lead-free pewter that is 22ct gold plated. The coin has two wings above a laurel wreath on the obverse and a horse galloping on the reverse. Known as the Bonnie Prince Charlie, Charles Edward was the last to try and restore his family to the British throne. 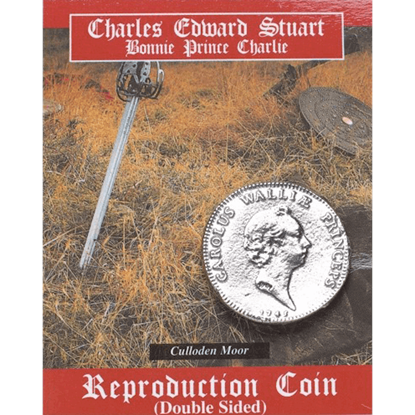 This Charles Edward Stuart Replica Coin Pack includes a replica coin attached to a card with historical information. This coin commemorates not one, but two English kings, who both warred with Scotland in their lifetime. 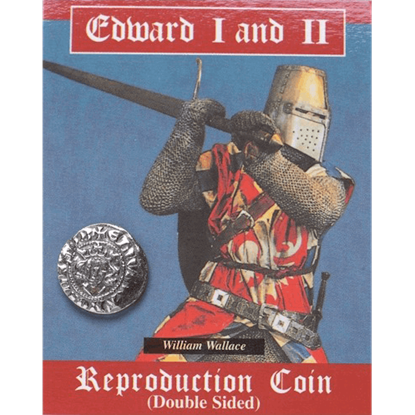 The Edward I and II Replica Coin Pack includes a replica coin attached to a card that features information about both kings. 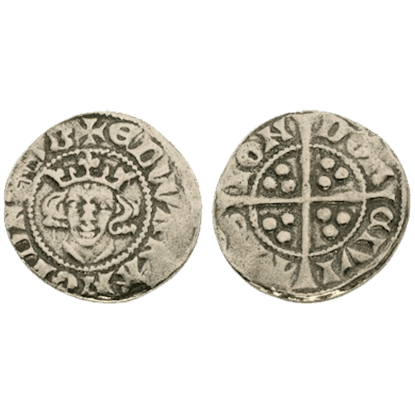 This is a reproduction Groat coin with the crowned facing bust of Edward I on the obverse and long cross with pellets in each angle on the reverse. Our Edward I Groat Coin is made from lead-free pewter and comes is a package of 10 coins. 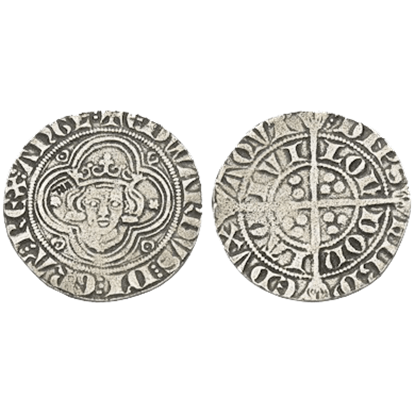 This is a reproduction Penny coin with crowned portrait of Edward I on the obverse and long cross with 3 pellets at each angle on the reverse. Our Edward I Penny Coin is made from lead-free pewter and comes in a package of 10 coins. This reproduction gold stater of the Catuvellauni, Whaddon Chase type, depicts the devolved head of Apollo on the obverse and horse on the reverse. These Gold Stater Of The Catuvellauni Replica Coins come 10 in a pack. 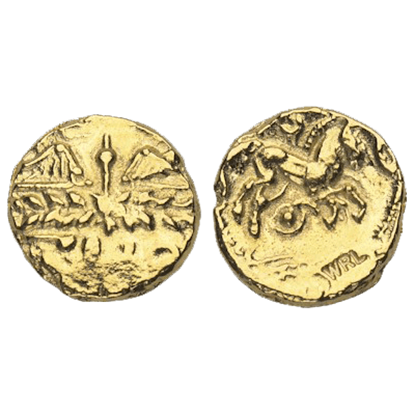 This is a reproduction gold stater coin of the Catuvellauni under Cunobelin with divided corn ear on the obverse and horse on the reverse. These Gold Stater Of The Catuvellauni Replica Coins come 10 in a pack. 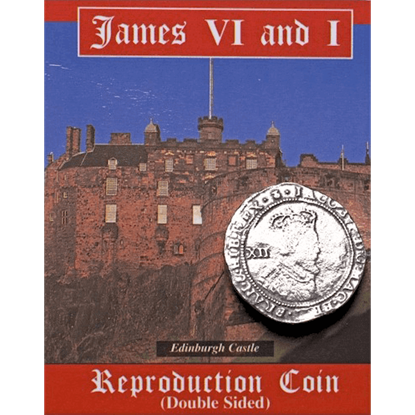 Featuring a realistic and authentic look, this James VI and I Replica Coin Pack commemorates one king who ruled two nations. The coin comes attached to a card that features Edinburgh Castle on the front with historical info on the back.